25+ award winning years leading on the West Coast of Vancouver Island. Professional kayak tours for half day, full day and multi day adventures from Ucluelet, in Barkley Sound and the Broken Group Islands, Pacific Rim National Park Reserve, and in Clayoquot Sound-Tofino. Voted Ucluelet’s #1 Kayak Company For 25+ Years! We had a wonderful morning/afternoon paddling the Broken Group Islands. Everything was top notch, from start to finish. This was our second trip to Tofino and 2nd kayak day trip. It was our first with Majestic. The trip was the reason you come to the Pacific Rim National Park. The Broken Islands tour was a trip into paradise. Highlight of our month long Canada trip – magical. Our guide, Laura, was magnificent, very knowledgeable and my daughter took to her immediately – and loved it when Laura produced a star fish for her to hold. Loved this kayaking trip. Lots of eagles, peaceful, easy-going and beautiful views. Highly recommended! The destinations on the right represent some of Vancouver Island's most spectacular locations. Find out more about them, their history, how to get there and the experiences we offer. 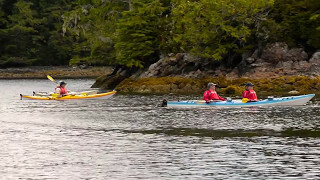 Majestic Ocean Kayaking offers a wide variety of all-inclusive kayaking adventure tours, ranging from day trips in Ucluelet, Barkley Sound and the Broken Group Islands of the Pacific Rim National Park Reserve. And our unique multi-day tours to the Broken Group Islands, Ucluelet and Clayoquot Sound, Tofino. Explore tiny islands and quiet coves, and camp on white sandy beaches. Watch for whales, eagles, bears and abundant intertidal life. Our certified professional sea kayak guides will share their extensive knowledge of the rich natural and cultural history of the west coast of Vancouver Island. Our Vancouver Island kayaking tours include the use of top of the line double and single fibreglass kayaks from Nimbus and Seaward. We provide all kayaking and camping equipment and serve hearty, homemade food to our kayakers using locally sourced ingredients and our healthy tried and trusted recipes. 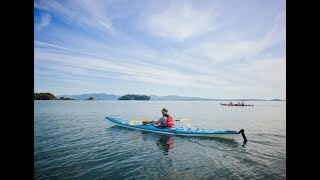 In British Columbia kayaking is the best you will find anywhere in the world, especially if you visit the west coast of Vancouver Island.